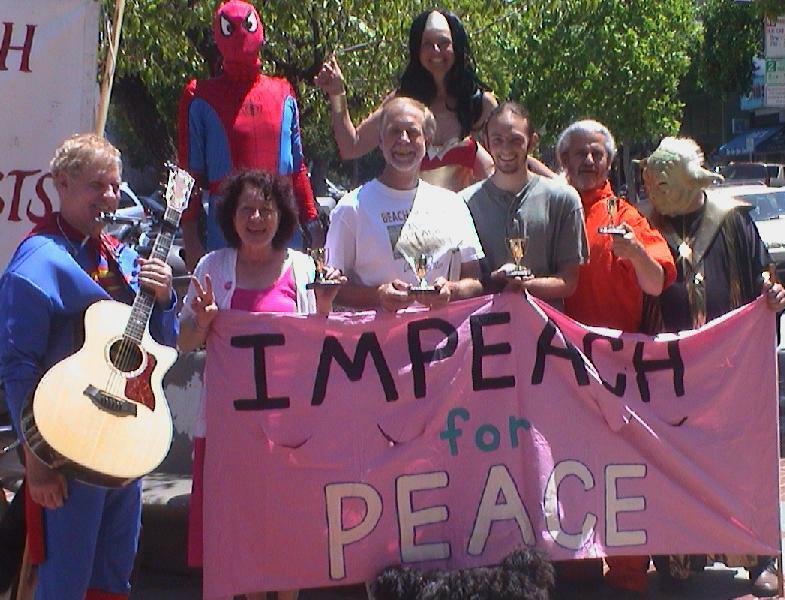 Brad Newsham (organizer of the San Francisco- Beach Impeach), Cynthia Papermaster (Code Pink- organizer of impeachment rallies and marches on Pelosi’s home and office), Don Spark (World Can’t Wait- organizer of Impeachment events/marches), and Carol Wolman (ImpeachBush-Cheney.com - who also ran on Impeachment platform in 2006). The Superheroes were the first to arrive at Lytton Plaza in downtown Palo Alto yesterday, incognito, setting up banners and tables, and doing the “work” to prepare for the 1:00 p.m. rally. Annie and one Veteran for Peace, George Johnson, opened the rally with their new “Impeachment” song, followed by the Raging Grannies. 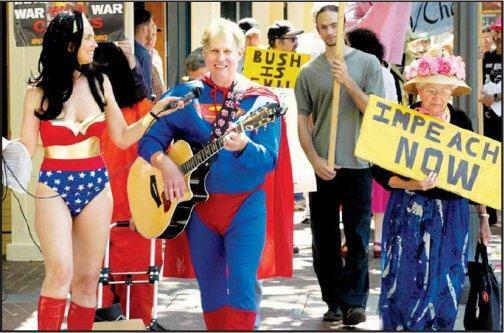 August Bullock, dressed as Superman, sang the “Heroes of America” song that inspired the theme for this fourth monthly impeachment rally. Ann Horst-Person's "The Devil's Departure" premiered at the Dillon's Nirvana theater club restaurant in NYC this past Sunday, the 7th of January, at 245 West 54th St., to an enthusiastic crowd of savvy New Yorkers, in on the secret (to the general public) that the events of 9/11/01 were a staged false flag terror attack instigated by obscure powers affiliated with the government who, though not in league with the Devil, have instead outdone him. The playwright Ms. Horst-Person's husband Carl Person attempted to run for New York Attorney General of New York in the last election with the intention of investigating the 9/11 crimes. He was unable to get on the ballot because of very strict New York laws regarding 3rd party candidates. Outstanding performances by Damien Dimino as Mr. "D" - the Devil, Sherry Mandery as Natalie Barker, his secretary, Douglas Cerranto as the Reporter and Robby Brennan as Wayne Holloway, a depraved pet store owner. Shown above on the far right is Ms. Horst-Person.